Corridor Mobility Preliminary Engineering Reports (PERs), or Corridor Plans, are a tool the City of Austin uses to assess a specific corridor’s mobility and safety deficiencies, and identify a vision for the long-term future of the corridor based on anticipated growth and City of Austin transportation policy. The goal of the Corridor Mobility Reports is to develop recommendations to enhance safety, access, and mobility in order to design a roadway that serves all users – whether they ride their bikes, walk, take transit or drive. Corridor Mobility Reports are Preliminary Engineering documents, which provide a basis for further analysis and development of potential projects. Many roadways in Austin are rapidly evolving due to changes in commuter patterns, population growth, new and different types of development and property uses, and more. These changes contribute to mobility, safety and access concerns throughout the transportation system. A typical Corridor Mobility Report may include recommendations such as intersection improvements, new sidewalks and bicycle facilities; bus stops, and roadways that accommodate transit. The 2016 Mobility Bond, approved by Austin voters in 2016, provides $482 million in funding for Corridor Improvement Projects. 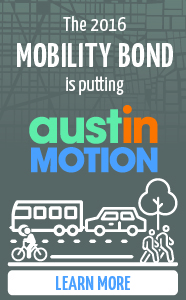 Learn more about the 2016 Mobility Bond Investment in corridors at AustinTexas.gov/CorridorMobility. Slaughter Lane: Wednesday, Aug. 22 at Bethany Lutheran Church, 3701 W. Slaughter Lane, from 5 - 8 p.m. Learn more about upcoming public meetings by visiting AustinTexas.gov/WhatsNew or by calling Sara Behunek at (512) 974-7840.